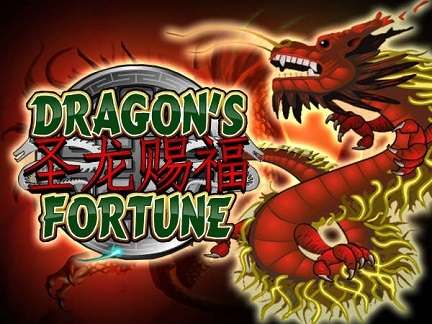 Dragon’s Fortune Online Slot Title – A Unique Way To Win. Players unfamiliar with the Dragon’s Fortune casino game may want to give it a try-out at mobile and online casinos, or via a downloadable app. It is generally listed in the slots category, although it has no reels, and play resembles a simple lottery rather than a classic fruit machine. So it can be a refreshing change for players seeking a little novelty. In design, Dragon’s Fortune plays out against a traditional Chinese painting, with palms and clouds in the foreground, and a mountain silhouetted against the sunset in the distance. To the right is a fire-spitting red dragon with a showy golden mane, while an ornate brass dragon-headed gong hangs horizontally in the centre of the screen. A series of eight different coloured pearls bearing Chinese ideograms, each displaying its own fixed multiplier, stands to the left of the Dragon’s Fortune screen. Game controls, which allow players to bet up to 1,000 coins per game, are located in an ornate dashboard embellished with oriental touches below the action. Once Dragon’s Fortune players have used the plus and minus signs housed in a yin/yang mandala to set their stake, they press the Play button. The dragon then spits out six electric-blue fireballs, each of which lands on the gong with a clang and turns into a pearl in one of the eight colours. These pearls are racked on a bamboo stand above the gong, and once all six have been spat out by the dragon, the results are assessed. 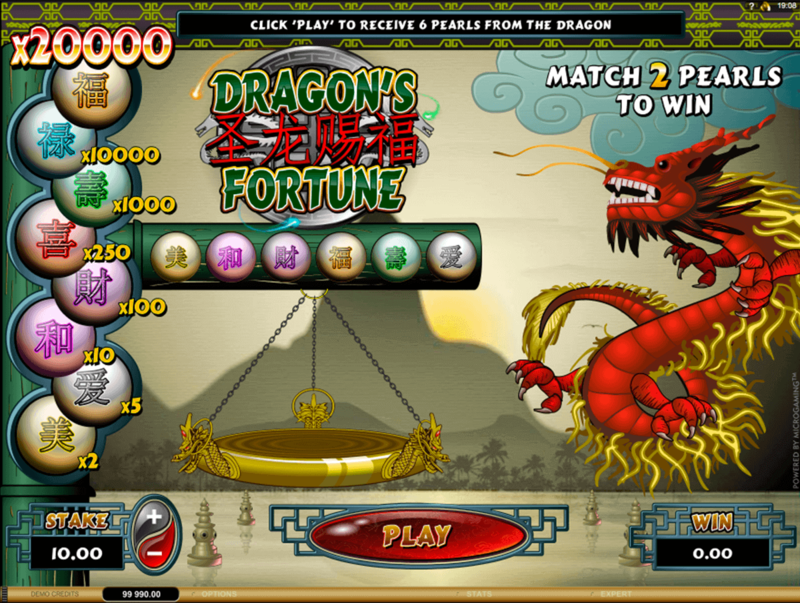 To win a prize in Dragon’s Fortune, the player needs to get at least two pearls that match in any batch of six produced by the dragon, in any position. If they manage to do this, the prize depends on the multiplier attached to the winning pearl colour, multiplied by the player’s real money pokies total stake. In increasing order of value, the Dragon’s Fortune pearls are Yellow, with a X2 multiplier, Grey with X5, Pink with X10, Purple with X100, Red with X250, Green with X1,000, Blue with X10,000 and Gold with X20,000. At a maximum bet of 10.00, two Gold pearls can thus win 20,000.00 in the relevant currency. Because the player needs only two matching pearls to win a prize, and the dragon spits out six pearls per game, in theory a player can score three matching pairs and thus win a triple prize on one game. This is quite rare, however, although low-value wins for a single pair of Yellow, Grey or Pink pearls are quite common. Players should choose a stake that allows them to play for quite a while in search of the impressive wins. The Purple, Red, Green, Blue and Gold pearls show up in pairs much less frequently, but when they do crop up after long-term play, they can provide handsome profits that can wipe out a long string of losses. In this respect, playing Dragon’s Fortune with a long-term strategy to dig out the big wins makes it very similar to more traditional, reel-based slots.